A wave of increasingly sophisticated militant attacks in northeastern Nigeria has forced almost 60,000 people to flee since November, the largest number for more than two years, raising fears from the UN and aid groups of a renewed Boko Haram crisis. More than half of those who fled escaped a series of Boko Haram attacks in the remote town of Rann, near the border with Cameroon, in January. The violence – which killed dozens of people – sparked two large waves of displacement across the border. Thousands of the Nigerian refugees were forcibly returned by the Cameroonian authorities. Since Boko Haram’s insurgency began in 2009, at least 35,000 people have been killed. Attacks across the wider Lake Chad region – which encompasses parts of Cameroon, Chad, Niger, and Nigeria – have seen some 2.5 million people displaced, including 1.9 million internally in Nigeria and some 250,000 Nigerian refugees. Although the Nigerian government has regularly made claims that the jihadist threat has been minimised, evidence on the ground suggests otherwise, and there are concerns that Nigeria’s general elections on 16 February may make the situation worse. Boko Haram launched a 14 January attack that reportedly killed 14 people in Rann. Homes and buildings were destroyed, including Médecins Sans Frontières and UNICEF clinics, as well as compounds belonging to the International Organisation for Migration, the World Health Organisation, and the International Committee of the Red Cross. Regional troops fighting Boko Haram worked to secure the town, but when they withdrew more than 9,000 people fled, on foot, towards Bodo in Cameroon. About 1,800 of them – mostly women and children – managed to remain with host families in villages near Makary and Fotokol, according to David Manan, Cameroon director for the Norwegian Refugee Council. But the majority were forced out of Cameroon, with little choice but to return to Rann. About a week later, another 35,000 people fled Rann for Cameroon, fearing another militant attack. Most now reside in a makeshift settlement in the Cameroonian village of Goura, UN News reported, saying the refugees are safe and haven’t – for now – been asked to leave. 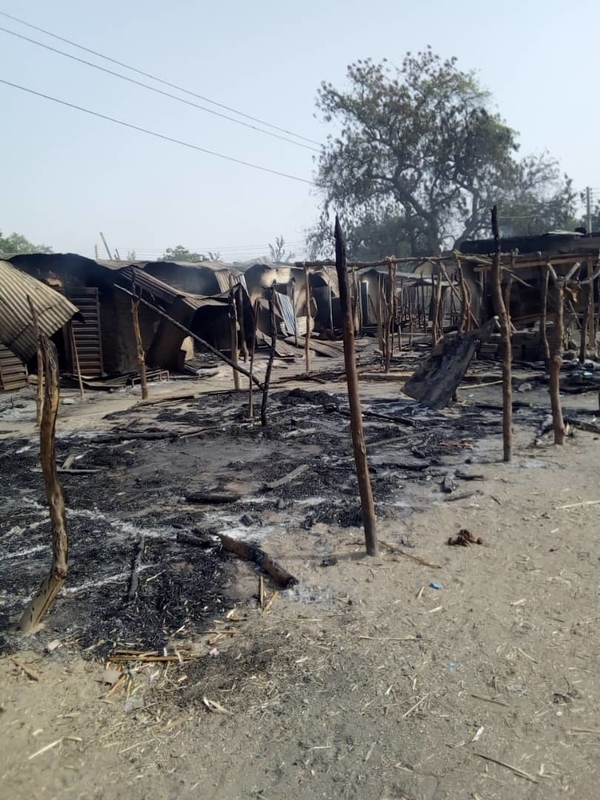 Photo Courtesy by Zara Abicho/MSF: Fearing further attacks, more than 35,000 of Rann’s residents have sought refuge across the border in Cameroon. On 28 January, Rann residents’ worst fears were confirmed when at least 60 people were killed in the deadliest attack yet on the town by Boko Haram, who also destroyed hundreds of shelters for displaced people. Is Cameroon forcibly returning refugees? Cameroon, which hosts more than 370,000 refugees – 100,000 from Nigeria – turned back the first wave of refugees from Rann, in a move reminiscent of previous actions that saw tens of thousands of Nigerians forcibly returned between 2015 and 2017. The UN’s refugee agency, UNHCR, expressed immediate alarm, saying it was “gravely concerned” about the safety and living conditions of people who were returned last month. “This action was totally unexpected and puts lives of thousands of refugees at risk,” said UN High Commissioner for Refugees Filippo Grandi. Cameroon fears infiltration by Boko Haram, who have mounted scores of attacks since 2014 in the country’s Far North Region – typically suicide bombings. Cameroon’s military has recently reported a resurgence in Boko Haram activity along its border with Nigeria and said there were five attacks in the region in January alone. After the second wave of 35,000 people fled Rann, aid groups, including the NRC, urged Cameroon to keep its borders open, emphasising the need to assist those fleeing. So far it appears that the Cameroonian authorities have kept the border open and no more forcible returns have been reported. Photo by Isa Sadiq Bwala/MSF: A burnt market in Rann, Nigeria. “The situation in the northeast [of Nigeria] remains volatile and forced return is exposing these people to harm,” said Idayat Hassan, director of the Abuja-based Centre for Democracy and Development, a policy and advocacy think-tank covering West Africa. What are the humanitarian needs? Across Nigeria’s northeastern Borno State and in neighbouring countries, existing camp facilities are overstretched. Having thousands flock to the same locations leaves people in dire need of shelter, food, and water, and can lead to unsanitary conditions and greater risk of disease outbreaks, Hassan told IRIN. Because of the “spike in attacks” and displacements in Borno State since November, NRC expressed concern about the resulting humanitarian crisis. In Cameroon’s Bodo, MSF said it was assisting new arrivals with food, water, and medical care. In Goura, the UN and its partners responded to the sudden influx by providing basic services, including shelter and protection, in the makeshift settlement. UNHCR’s Türk said the priority was to “save the life of everybody who was able to escape”. Türk said while immediate emergency assistance is the main focus, it’s also essential to support vulnerable host communities and refugees who have been in camps for a long time – assisting them with access to education, health facilities, and social protection. How much of a threat is Boko Haram? Many of the attacks in recent months have been attributed to fighters from Islamic State West Africa Province, or ISWAP, a faction of Boko Haram that broke off in 2016. The Nigerian government is quick to downplay the potency of the militants, but renewed attacks on military outposts, aid workers, and civilians suggest they have grown more aggressive, and possibly also in number and strength. At least 100 soldiers have been killed since late December, according to a report seen by Reuters. IOM also noted the “increased sophistication” of the attackers. Matthew T. Page, a former US State Department official and associate fellow at the Chatham House think tank, said Nigeria’s political and security leaders were unable or unwilling to devise a comprehensive counterinsurgency strategy. “Their piecemeal approach is not commensurate with the seriousness and complexity of the threat,” he said. International aid organisations are stepping up their response. A new $135 million humanitarian appeal was launched last week to assist Nigerian refugees and host communities in the three other Lake Chad countries, but last year only 42 percent of a similar appeal for $157 million was funded. UNHCR, which is coordinating the response plan, says recent violence has pushed people into “crowded camps or in towns in Borno State where they are surviving in tough living conditions”. But the threat of new attacks remains. And there are additional security concerns in light of the upcoming elections. Boko Haram ramped up attacks in the weeks leading up to the 2015 elections and may be doing likewise this time. Meanwhile, insecurity across northeastern Nigeria means the possibility of everyone voting in affected towns remains slim. Mahmood from the ISS think tank said a lot would depend on the outcome of the Nigerian elections and how seriously any new administration is about tackling the Boko Haram threat. This entry is filed under Africa News.